At the core of managing your writing work is managing submissions. If you aren't querying, submitting, or chasing up submissions, you're not giving yourself the best opportunity to see your work published. Our submission tracking page gives you all the tools you need to stay on top of your submissions and to help you find out which markets are buying your work. Use our market submissions statistics and your own submission history to get visibility over your most successful pieces, so you can focus your writing efforts where they are most likely to result in publication, while identifying and addressing areas of weakness. Keeping track of which pieces you’ve submitted is critical to staying on top of your writing. It can take months to hear back, and work that isn’t under consideration is work that doesn’t have a chance of being published. Literarium gives you an overview of which of your pieces is waiting for a response, or what queries you’ve submitted to publishers. Keeping a history of responses and their timings gives you an excellent insight into which markets are more responsive. 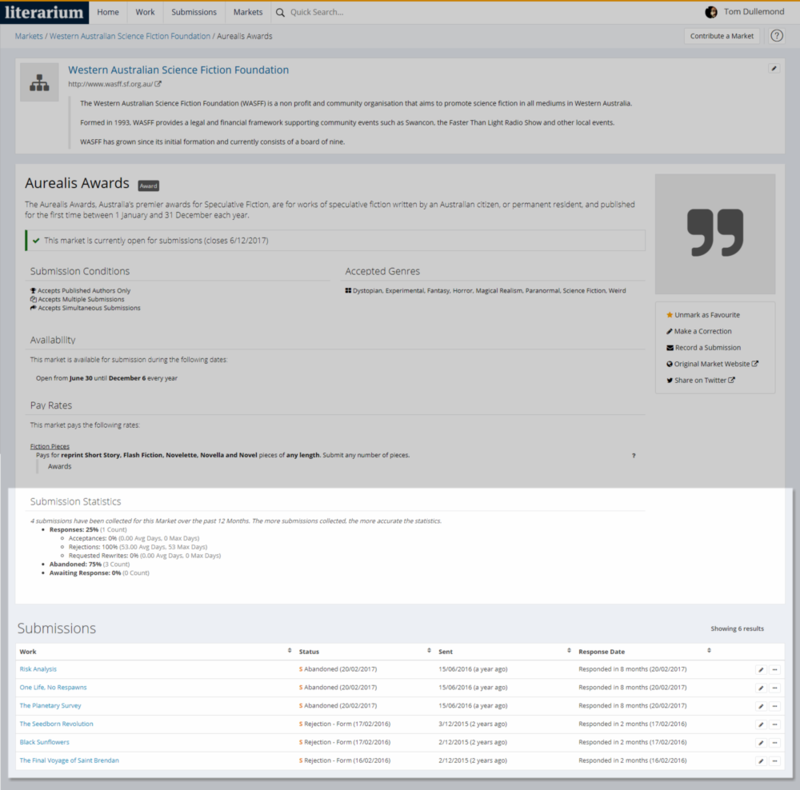 This lets you prioritise your future submissions. A quick rejection is a good rejection. By matching your work intelligently with compatible markets, and making it super easy to update your stats and resubmit, Literarium lets you focus on success, not rejection. Some submission constraints like genre, format, length are straightforward, but submission guidelines can get complex, particularly if you’re juggling many submissions at the same time. Some magazines don’t want to read your work if another market is already considering it. Other publishers may only be interested in work that’s been published before. And no one wants you to send them back a story that they’ve already rejected. It’s easy to overlook submission guidelines like these, and submitting to a publisher when your work isn’t appropriate may wind you up on their blacklist. Literarium will conveniently warn you if you’re about to submit work that is not appropriate to a market’s submission guidelines. With submission warnings With submission warnings you can feel confident in submitting as many pieces as you have lying around without fear of getting confused. As your submission history adds up, a clear picture begins to emerge of which kind of stories, poems or essays are selling, which markets are buying your work, and which publishers have reasonable turnarounds. This kind of professional, personal data is invaluable when making decisions about which direction to take your writing career, or which markets you should submit to first. By anonymously combining everyone’s submission statistics, market responsiveness and publication rates become visible to help you shape your submitting decisions. It’s all here in Literarium.